ACL stunned the industry when she introduced purple and white/silver diesels and passenger equipment, but none was more recognizable. Now part of the CSX Railroad, but her history is being saved by an aggressive historical society. 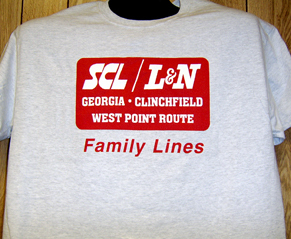 Individual marks are licensed marks owned by CSX Railroad Company and are used under an active license agreement. Dual service 4-8-4 R-1 Class steam locomotives were some of the largest ever owned by the Atlantic Coast Line Railroad and featured 16 wheel tenders. R-1s were used in fast passenger and heavy freights. Authentic enough that you just may feel the heat. 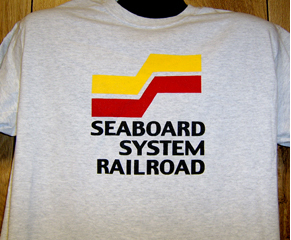 The Seaboard System Railroad is well represented on this light grey/ash 100% premium t-shirt. The Seaboard System later became the CSX. 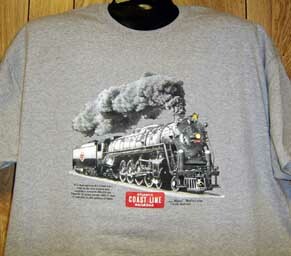 Perfect for every Railhead you know! 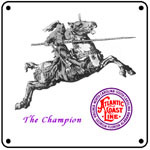 6 inch x 6 inch square tin logo sign of the Atlantic Coast Line Railroads Champion image. 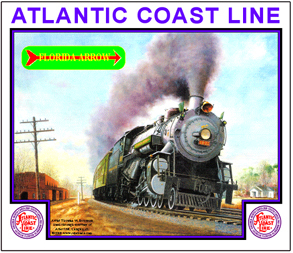 6 inch x 6 inch square tin logo sign of the Atlantic Coast Line Railroad in full color. 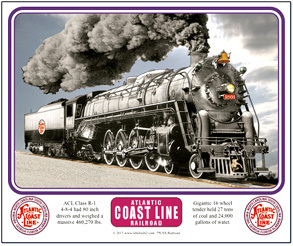 6 inch x 6 inch square tin logo sign of the Atlantic Coast Line Railroads long logo used mostly in print advertising. 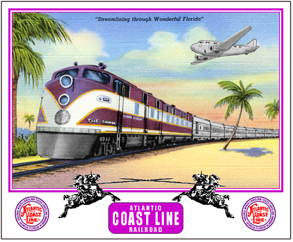 Mug features a beautiful purple and white Atlantic Coast Line passenger E-unit diesel rolling through tropical Florida. Beautiful steam locomotive heading up Atlantic Coast Line Railroads famous Florida Arrow passenger train heading for the sand and palms of Florida. Print courtesy of Al Langley. These dual service 4-8-4 R-1 Class steam locomotives were the largest and most modern steamers ever owned by the Atlantic Coast Line Railroad. Beautiful purple and white Atlantic Coast Line passenger trains pulling in to the equally beautiful Orlando Florida train station. 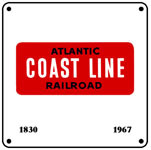 Atlantic Coast Line logo license plate. Beautiful purple and white E-unit diesel with classic ACL logo. 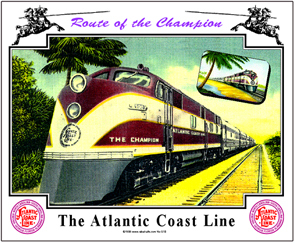 Colorful Atlantic Coast Line mouse pad with a beautiful passenger E-unit diesel rolling through the palms to tropical paradise. Pad features the beautiful Florida Arrow in steam heading down the coast to Florida Sunshine. Art by Mr. Thomas W. Solomon used courtesy of Mr. Albert M. Langley, Jr. 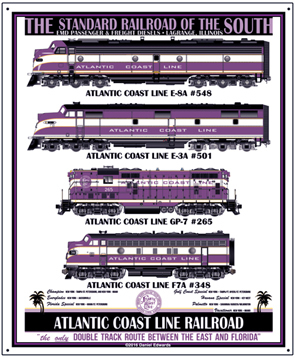 Mouse pads featuring the Atlantic Coast Line Railroads fast and powerful ClassR-1 4-8-4 locomotive with 80 inch dirvers and a massive 16 wheel tender. Colorful Atlantic Coast Line mouse pad with a beautiful passenger E-unit diesel rolling through the palms to tropical paradise with an early passenger plane high in the sky. Circa 1940s. A very nostalgic scene. 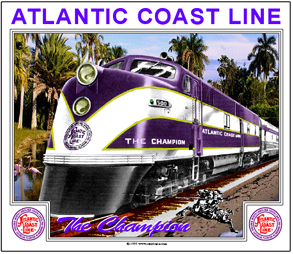 Beautiful Atlantic Coast Line Champion flagship passenger train in gleeming purple and silver with gold trim. This exclusive metal sign features the artwork of Daniel Edwards, and the detail is truly amazing. 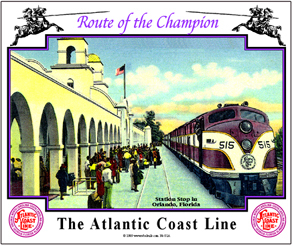 Beautiful scene of an Atlantic Coast Line passenger train stopped at the Orlando, Florida station. 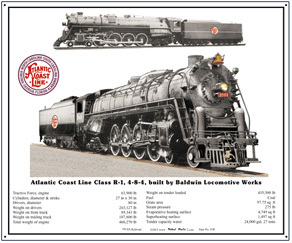 Great sign of the Atlantic Coast Line Railroads dual service R-1 Class 4-8-4 steam locomotive with builders specifications and builders photo. 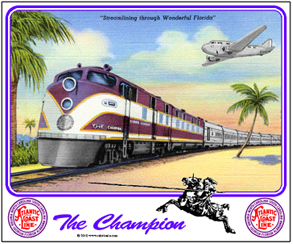 Beautiful Atlantic Coast Line Champion flagship passenger train rolling through Florida with a twin engine airplane following overhead. 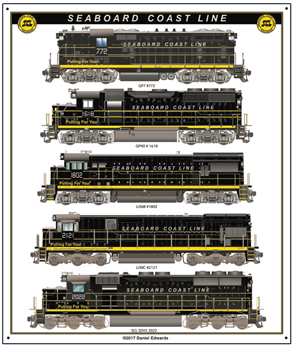 This exclusive metal sign features the artwork of Daniel Edwards, and the detail is truly amazing on these Seaboard Coast Line black/yellow diesels.